Arizona head coach Dave Rubio, talking to his players during a time out against Arizona State at McKale Center earlier this year, will coach the Cats against Cleveland State on Friday, his 19th appearance with UA in the postseason. Dave Rubio remains stoic as his players celebrate a point against Arizona State in September. Dave Rubio became the UA’s volleyball coach in 1992, after a national crown at D-II Cal State Bakersfield. Dave Rubio looks at the numbers, looks at the years and can hardly believe it. Rubio was 32 years old the day he arrived at Arizona, charged with rebuilding a program that had failed to win a conference match the year before. Nineteen NCAA tournament appearances, a dozen 20-win seasons and 477 wins later, Rubio is still here. The team had trouble surviving before Rubio’s arrival, going 0-18 in the Pac-10 under former coach Rosie Wegrich in 1991. Volleyball had always been Rubio’s life. Rubio started playing the sport as a boy and was heavily involved in the recreational league circuit with his dad. Rubio played setter — a coach on the court, the cliché goes — and played it well. Success at Granada Hills High School led to a scholarship to Cal State Northridge and, eventually, a career in coaching. Rubio started at his alma mater, Grenada Hills, coaching boys for one season, before moving to West Lake High School in Thousand Oaks and coaching girls for four seasons. Rubio found he connected better with the girls. Soon, colleges noticed. Cal State Bakersfield offered Rubio the head women’s coaching job in 1987. He accepted, acknowledging he was fortunate to get the offer. “Fortunately, everyone who they offered the job before they offered it to me had turned it down, so then I was their last resort,” Rubio said with a chuckle. Rubio did not perform like a last-resort coach. He turned the Division II school into a national powerhouse, and just two seasons after his hiring, led them to a national championship in 1989. He went 122-66 overall in his five seasons. Arizona thought enough of Rubio’s ability to hire him away from Bakersfield in 1992. In Tucson, Rubio’s job was daunting: Compete with arguably the fiercest competition in the nation. Arizona had the players, but the team chemistry was missing. Charita Stubbs, one of Rubio’s assistant coaches, witnessed the change first-hand. She was a redshirt sophomore when Rubio arrived in 1992. Stubbs described the transition between Wegrich and Rubio as “night and day.” Stubbs — then Charita Johnson — was an athlete, but knew little about the details of volleyball before Rubio’s arrival. Stubbs went on become the first-ever Wildcat to record 300 kills, 300 digs and 100 blocks in one season. Stubbs soon joined Rubio on the sidelines. She coached alongside him from 1997-2005 before being named head coach at North Carolina State, returning to the Wildcats in 2013. Rubio’s ability to teach and be patient with players’ development is rare, Stubbs said. She tries to model herself after him as an assistant. Kalei Mau was one of the nation’s top players coming out of high school. She signed with the University of Minnesota, where she spent one year before deciding the Golden Gophers were a poor fit. As Mau looked for a place to transfer, she made a mental list of what she wanted in a coach. She wanted to grow as a player, to master the sport. Rubio, she said, could help get her there. Rubio’s been improving, too. Rubio married Amanda in 2000, and together they have three children, Olivia (13) and twins Dylan and Lucy (10). He’s more empathetic when it comes to dealing with players. He makes more of an effort to understand them. There’s a “dramatic difference,” he says, between the young Dave Rubio and the older Dave Rubio. Twenty-five years later, Arizona is a powerhouse program. The Wildcats continue to be competitive in the nation’s most-competitive volleyball conference. 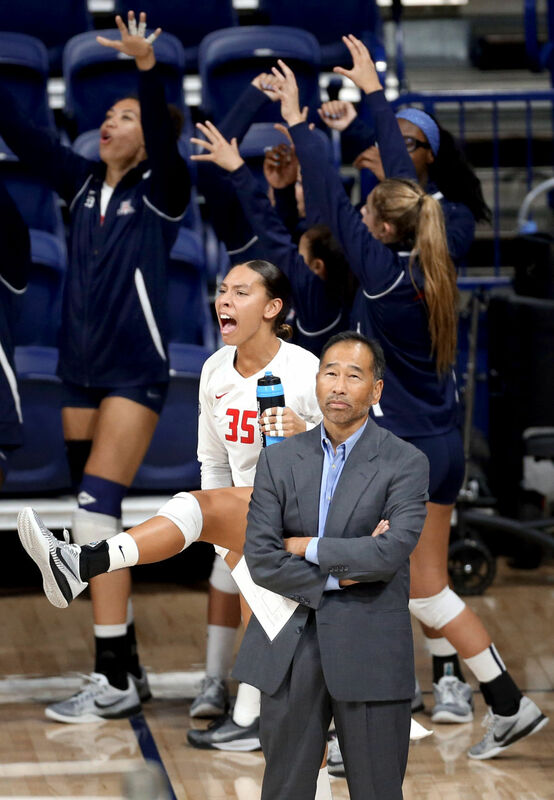 This season alone, the UA has defeated seven different ranked opponents and swept the season series against USC and UCLA for the first time. Arizona, finishing the season 10-10 in the Pac-12 and 18-14 overall, is headed to the NCAA tournament for the fourth consecutive season. It will face Cleveland State in the first round Friday in East Lansing, Michigan. For Rubio, this is his 19th trip to the Big Dance in his 25 seasons on the job. There’s a pride that comes with coaching this team, Rubio said. Forming strong relationships with his players and teaching them is something Rubio has worked to do over his 25 years with the program, and it’s why Stubbs continues to work with Rubio today. “For me, being back the second time around, it’s for him” Stubbs said. “I came back for Dave. While it doesn’t always come out clearly to the players, I know his intent. UA will open against Vikings on Friday, with the winner facing either No. 9 Michigan State or Fairfield. Kalei Mau, Kendra Dahlke lead Cats to upset victory over nation's No. 9 team.